I cook meat ahead of time and freeze it in ziploc bags. 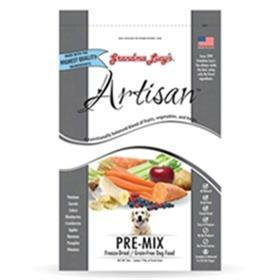 When I prepare my pets meal I add hot water to the premix, pop the meat in the microwave, mix together and it's ready. Great for travel also. Measure the portion in baggies and you'll all set to go.I add meat from restaurants or if possible bring frozen from home. I also add a little salmon oil. He loves it!